Tortora’s career with the Social Work Department has been characterized by opportunities that she has taken advantage of, both locally and on a national stage. 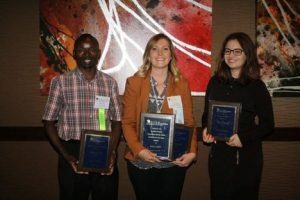 This March, she attended the National Association of Social Workers – Mississippi Chapter’s annual conference as the University of Mississippi’s nominee for Student of the Year. While there, she also assisted with the student research poster presentations and judging. Tortora also participated in Project Lift, funded by the Substance Abuse and Mental Health Services Administration. She was chosen from a nationwide pool of young leaders, aged twenty to thirty, studying and working in the behavioral health field. After the participants were flown to Bethesda for a two-day introductory trip, they undertook a seven-month “leadership immersion program”, which consisted of guest lectures, monthly mini-projects, and one overarching project. Tortora said that one of the perhaps unintended benefits of the program involved honing her time-management skills, as her group partners were divided between Mississippi, California, and New Jersey. The program’s biggest project involved retaining and recruiting people into the behavioral health care field. Tortora’s group created a booklet she described as a “school survival guide” for students entering the behavioral health care field, be it in psychology, sociology, social work. The guide walks students through what the many field-relevant acronyms stand for, points out scholarship opportunities, and discusses graduate school options. The booklet was published at the end of the program in the fall, and Tortora is hoping to get a PDF version live online as a free resource. Currently, Tortora works in the Department of Social Work in the Child Welfare Training Academy. After graduation in May, she plans to begin a three-month internship at Mill Creek in Pontotoc, a behavioral health clinic for adolescents from seven to twenty. Following her internship, Tortora will begin working on licensure for clinical status. Social workers must have two years of clinical supervision in therapy to attain Licensed Clinical Social Worker status. She intends to eventually become a therapist.